What makes science research valuable? The question can further be narrowed to ask when governments should fund scientific research. People who are critical of government spending often find government funded scientific research projects they deem wasteful and publicize them as examples of government waste. Sometimes the discussions are just political theater but the conversation does raise interesting questions. 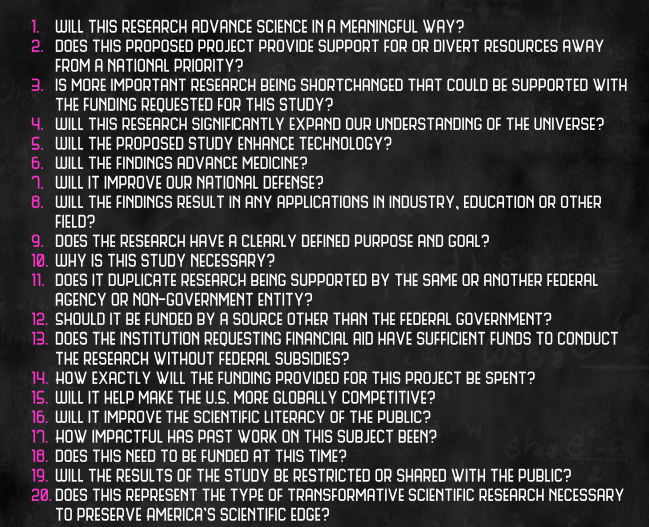 What is the government’s responsibility when it comes to funding science? What criteria should we follow when determining what is worthwhile and what isn’t? Arizona Senator Jeff Flake has on multiple occasions published lists of projects he thought were wasteful but he also published an interesting list of 20 questions he thought should guide our decisions on which projects deserved government spending. Will this research advance science in a meaningful way? Will the findings advance medicine? Will it improve our national defense? You can download his whole document here. Below is a link from Science magazine addressing the Senator Flake’s approach and assumptions. These issues were discussed on a Planet Money Podcast which was adapted from another podcast Undiscovered. This entry was posted in Natural Sciences, Planet Money, Podcast by Mr. Lakhaney. Bookmark the permalink.